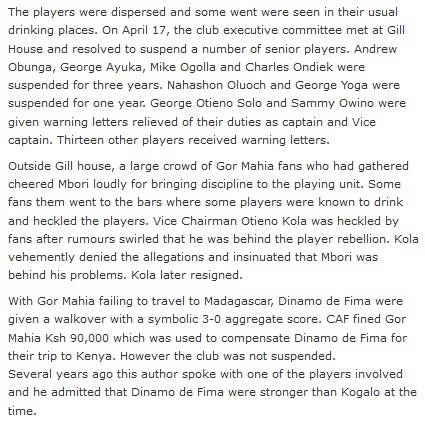 The Gor Mahia careers of Kempes, Obunga “Singh” and Ogolla “Machine” effectively endd after the Dinamo De Fima fiasco. 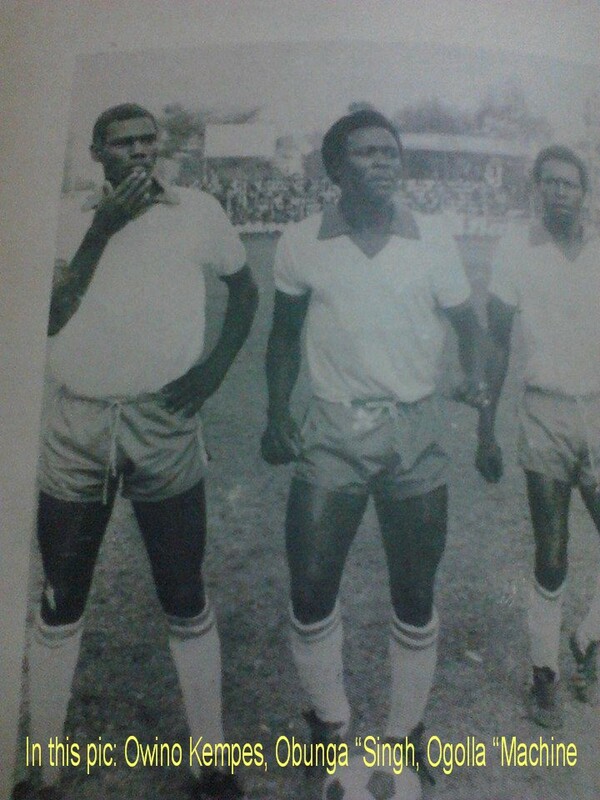 Kempes left for Alabama to pursue a football scholarship, Obunga joined Re Union and later went to India for further studies. 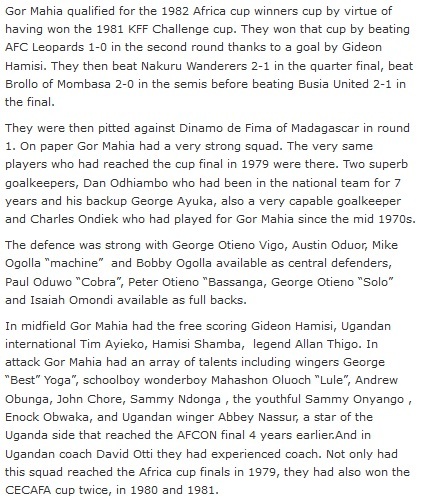 Ogolla “Machine” seemingly retired from football. 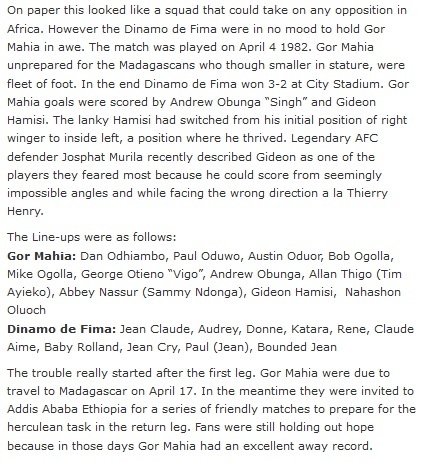 Throughout my “career” as a Gor Mahia FC fan, I have never seen any scorcher close to what “Artillery” Nyangi Odembo unleashed on the Madagascans during the 4th All Africa Games at Nyayo. 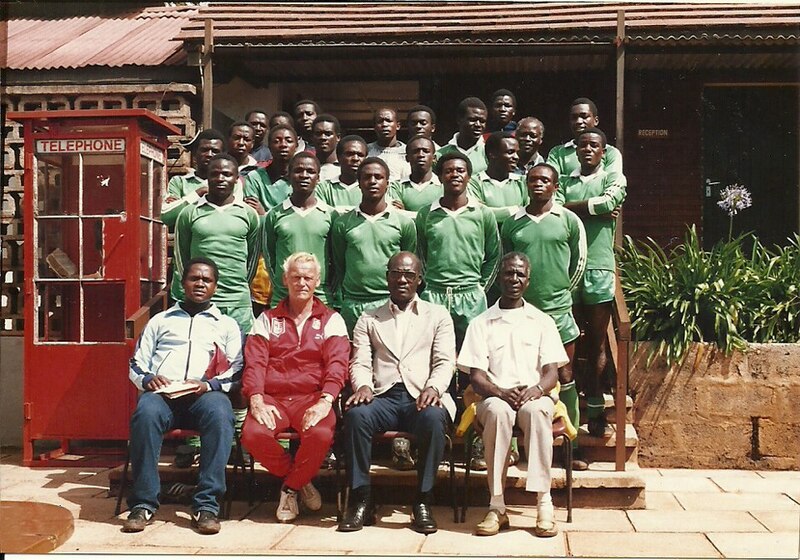 I was a small boy then, but I remember goalkeeper Razafindralambo being treated with ice-cold water by the late Peter Olimo after he made the mistake of trying to stop the Nyangi shot with his gloved hands. It is true the Madagascans are small in stature, but very fast and fleet-footed with accurate-one-touch ground ball crisp passes. 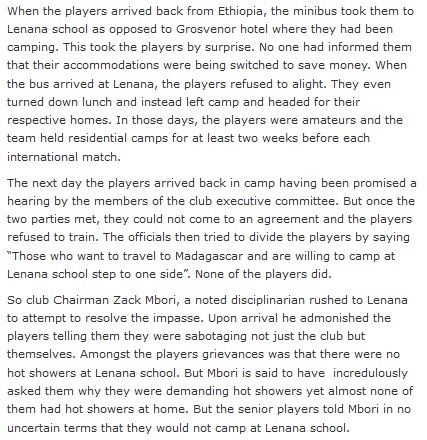 This a very incisive and insightful analysis from Muroro Pacho. We need more of such intelligent analysis to be posted in this site as we remember past with nostalgia or wistful affection for the past. The posting really has given me a sentimental longing for being a supporter of this great club. 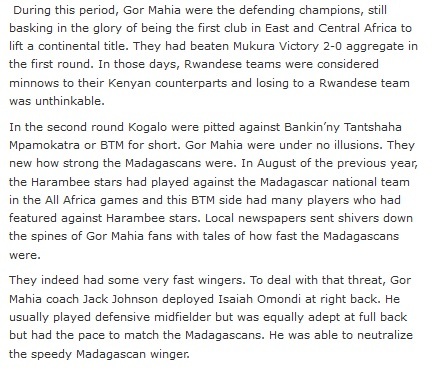 I will forever remain a Gor Mahia fan. Thanks Muroro for a great piece. I wholeheartedly concur with Mwakio. Sometimes I have to push back tears when I remember and reminisce on the moments of joy and ecstasy that this great team has given us!! In triumph and glory, in defeat and gloom KOgalo for ever!! 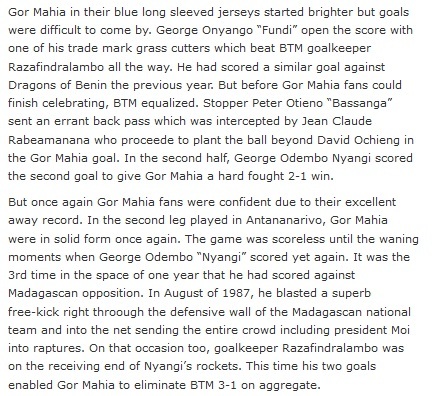 I remember how Nyangi brought the president to his feet with that superb freekick. 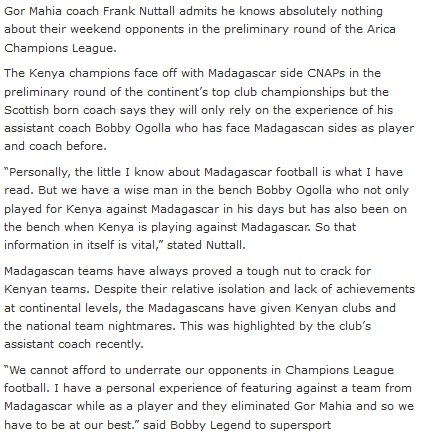 However I will tell you one fellow whose shot was more powerful than Nyangi and that is none other than current asisstant coach Bobby Ogolla. And his free-kicks were very accurate. where do we get the videos?